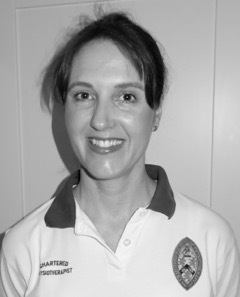 I am a South African qualified physiotherapist and completed my BSc in Physiotherapy in 1993. I commenced work in England in 1996. I worked in a variety of different positions across England (from the Isles of Scilly to Lincoln), with a main focus on Musculo-skeletal Out Patient physiotherapy and Care of the Elderly/Community Physiotherapy. In 2001, I joined the Pain Management Programmes/Back in Action programmes at the Leicester General Hospital; working closely with the Pain Consultants and the Orthopaedic Spinal team. During this time I completed my Masters in Pain Management. The 9 years as lead physiotherapist within a multi-disciplinary team developed my interest in how any individual reacts to their pain experience; whether in an acute situation or following extended periods of persistent pain. In 2010, I joined the Melton Mowbray Physiotherapy and Sports Injury Clinic, continuing to develop my MSK skills and applying Cognitive Behavioural Therapy skills to enhance people’s motivation to improve their activity level. In particular working more with a variety of sports injuries, understanding each person’s drive to improve their individual performance. I have a keen interest in biomechanics and how the body works and firmly believe that education and advice on how to manage the condition are fundamental to successful treatment and outcome. I also worked as a Clinical Specialist for InHealth Pain Management Solutions in Nottingham for nearly two years. The development of research in pain and how it affects us will always interest me, ensuring that I keep up to date with research and treatment options for all pain conditions. In the 20+ years of being a qualified physiotherapist I have dealt with a vast variety of injuries and symptoms, but have worked extensively within musculo-skeletal practice to become an accomplished MSK physiotherapist. My fascination and intrigue with understanding the amazing ability of the human body to adapt, recover and perform still drives me on. I continuously review new research, and the best possible ways to help whoever has an injury, long or short term, reach their fullest potential. Copyright © 2016 Melton Mowbray PhysioPlus. The content on this website is owned by Melton Mowbray PhysioPlus and our licensors.